AIM: To lead students to understand that Jesus Christ was crucified in precise fulfillment of Old Testament scriptural prophecies, and to encourage them to thank God for planning for their redemption. Psalmist David – 1,000 B.C. Prophet Isaiah – 740 B.C. Prophet Zechariah – 520 B.C. INTRODUCTION (Create Learning Readiness): Direct the students’ attention to the names and dates written on the board. Read those names and dates. Point out the fact that the lives of these people were spread over a 1,000-year period of time. Ask: “Do you have any idea what these four people have in common?” (David, Isaiah, and Zechariah all wrote about the crucifixion Jesus would suffer). Tell the class the writings of David, Isaiah, and Zechariah contain very specific details about the death of Jesus Christ on the cross – even though crucifixion was not invented until hundreds of years after they died. Tell the students if we turned on the TV news today and found the newscaster describing in great detail some major news events that would take place tomorrow, we would think it was a hoax or a joke. But if tomorrow came and those news events happened exactly as described the day before, it would get our attention. We would probably watch that newscaster every day, in hopes of learning what would happen in the future. Tell the class that God drew attention to the sacrificial death of His Son in exactly the same manner. He described it for His people in great detail hundreds of years before it took place. Ask: “What was last week’s lesson about?” (Pilate declared Jesus innocent three times, but he caved in to political pressure and condemned Jesus to be crucified; students were encouraged not to compromise their convictions). Tell the class that because of political pressure, Pontius Pilate, the Roman governor, condemned Jesus to death by crucifixion. 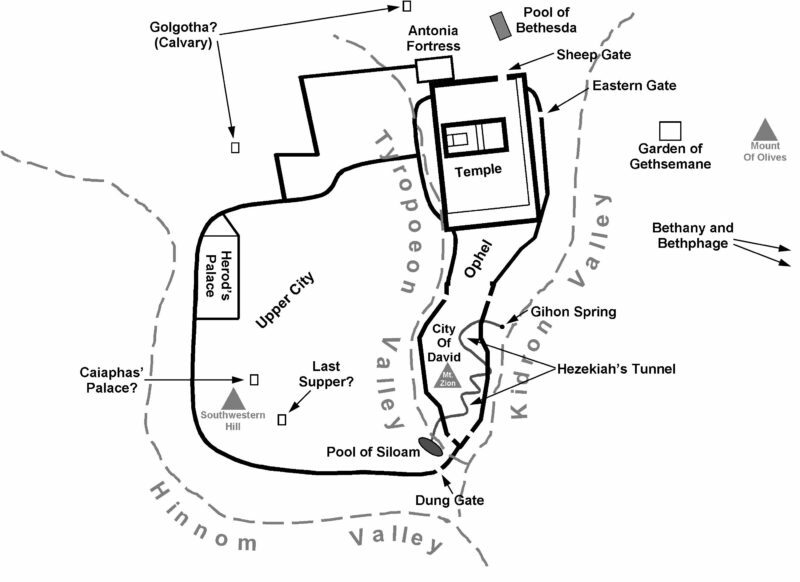 Point out the two possible locations of Golgotha on the map. The soldiers stripped Jesus, laid Him on the ground on top of the cross beam, and nailed His hands or wrists to the beam. They then hoisted the cross beam (and Jesus) up and secured it to the upright member. Finally, they nailed His feet to the upright beam of the cross. Crucifixion was a very slow and agonizing death. Ask: “Who was crucified alongside Jesus?” (two other convicted criminals). Ask the previously enlisted volunteer to read Isaiah 53:12. Direct the class’ attention to the names and dates written on the board and remind them that Isaiah lived and wrote 700 years before Christ. Ask a volunteer to read John 19:20-22. Ask: “How did the Jews feel about the sign Pilate placed on Jesus’ cross?” (they objected to it, but Pilate left it in place). Summarize: Even though He was innocent, Jesus was crucified between two criminals – just as Isaiah had prophesied 700 years earlier! Ask: “What did the soldiers do while Jesus was on the cross?” (divided up His clothing). Ask the previously enlisted volunteer to read Psalm 22:14-18. Tell the class John’s Gospel does not include all the details of Jesus’ time on the cross. Ask the previously enlisted volunteers to read Psalm 22:1 and Psalm 22:6-8. Stress the fact that the things that happened while Jesus was on the cross directly fulfilled Old Testament prophecies. Direct the class’ attention to the names and dates written on the board and remind them that David lived and wrote 1,000 years before Christ. Point out from verses 26-27 the compassion Jesus showed toward His mother. Even while He was suffering, He thought about her care. Ask the previously enlisted volunteer to read Psalm 69:21. They gave Jesus vinegar to drink in direct fulfillment of prophecy. Summarize: The events that took place while Jesus was dying on the cross occurred just as David had prophesied 1,000 years earlier! Jesus’ was crucified on the day before the Passover. In order to avoid defiling of the land on a holy day (see 21:23), the Jews asked that the criminals’ legs be broken to speed their deaths. Ask the previously enlisted volunteers to read Psalm 34:20, and Zechariah 12:10. Tell the class those are the verses John quoted in John 19:36-37. Direct the class’ attention to the names and dates written on the board and remind them that David lived and wrote 1,000 years before Christ and Zechariah lived and wrote 500 years before Christ. Ask everyone to look back at verse 35. Tell the students that John was an eyewitness of Jesus’ crucifixion. In verse 35 he told his readers that the things he wrote were true. Ask: “According to the last phrase of verse 35, why did John write these things?” (in keeping with the theme of his entire book, “that ye may believe”). Ask: “What do these verses tell us about Joseph of Arimathaea?” (he was a disciple, but he feared the Jews so he kept that fact secret). Tell the class from the other gospels we learn that Joseph was rich ( 27:57) and he belonged to the Jewish ruling council, the Sanhedrin (Luke 23:51). Ask: “Who helped Joseph with Jesus’ burial?” (Nicodemus). Ask the previously enlisted volunteer to read Isaiah 53:9. Jesus was buried in a rich man’s sepulcher (Matt. 27:59-60), in direct fulfillment of Old Testament prophecy. Summarize: Jesus’ bones were not broken, His side was pierced, and He was buried in a rich man’s tomb, just as David, Zechariah, and Isaiah had prophesied hundreds of years before those events took place! PERSONAL APPLICATION: Jesus was crucified. Expert executioners put Him to death in a very cruel and painful manner. The Roman soldiers attested to the fact that Jesus was dead. No one who witnessed those cruel and violent proceedings had any doubt in their mind that Jesus of Nazareth was dead. Ask: “Why was Jesus crucified as He was?” (in fulfillment of prophecy and according to God’s perfect plan). Every aspect of His death was planned precisely from before the creation of the world (see Rev 13:8). God the Father planned this brutal death and Jesus Christ endured this brutal death for all those whom He would redeem. If you are saved, Jesus Christ did all this for you! The realization of this fact should cause us to thank God for His goodness, mercy, and grace. Jesus Christ died to pay the price for our sins. Urge anyone who has never accepted the gift of salvation available through Jesus Christ to do so now. Urge Christians to thank Jesus for dying for them. Ask everyone to bow their head and close their eyes. Invite your students who are comfortable praying aloud to verbally express in prayer their thanks to God for the sacrificial death of Jesus Christ. Tell them anyone who is uncomfortable praying publicly may remain silent. Allow a few minutes for those who are willing to pray aloud and thank God to do so. Voice a closing prayer. CONCLUSION: Ask everyone to memorize Isaiah 53:6. Encourage them to thank Jesus every day this week for dying for them.